Seiryu Rods for Keiryu Fishing? Seiryu rods for keiryu fishing? Why not? They are soft rods, but the "zero" or ZPRO keiryu rods are soft also. In fact, zero rods and seiryu rods have a lot in common. I almost titled this page "Why didn't I think of that?" Not long ago, I got an inquiry from a guy who is thinking of starting a guide service for keiryu fishing. He lives in an area of the country where bait fishing is common, and would center his business on a heavily stocked tailwater that is a "put and take" river. The fish are stocked with the understanding that this particular river is definitely "hook and cook" rather than catch and release. 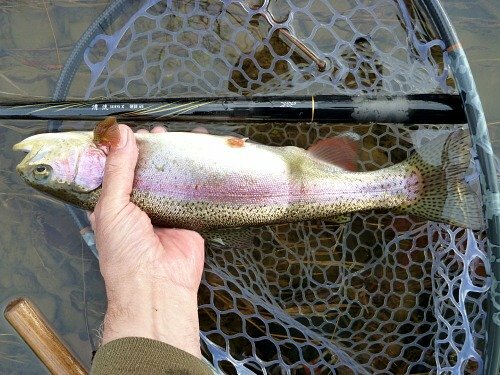 When trout are caught there, they're generally kept. He has fished with keiyru rods long enough to understand and appreciate the advantages offered by the very long rod, very light line and very sensitive strike detection. I am sure he is right in thinking that his clients will catch more fish with his approach than they would on their own with a spinning rod and a bobber, or a spinning rod and a split shot. I have to think that a guide client basically wants to catch fish, first and foremost, and perhaps learn something new in the process. Both of those wants should be satisfied with keiryu fishing. 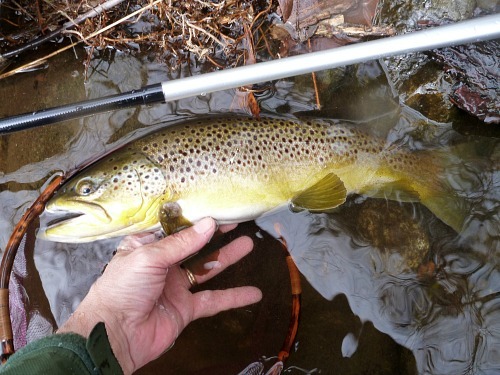 Truth be told, they would be satisfied anywhere in the country, but fly fishing and catch & release are so dominant nearly everywhere trout are pursued that a guide service centered on bait fishing might be very difficult to get off the ground in most places. That is unfortunate, especially since the strike detection in keiryu fishing is so sensitive that it is easy to set the hook before the bait is swallowed. Deep hooking is not common while keiryu fishing. Bait fishing and catch & release are NOT mutually exclusive. caught with a Suntech FMX Keiryu ZPRO 63. The kicker (and the "kick me, I should have thought of that") is that he will be using seiryu rods rather than keiryu rods. 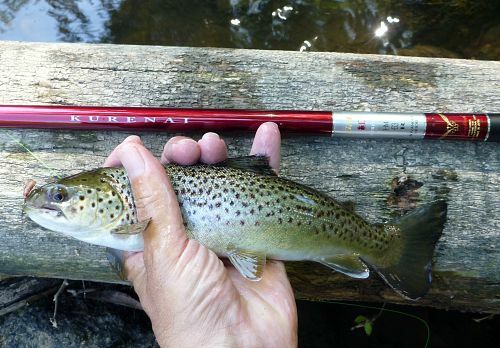 Keiryu rods are designed for trout fishing in mountain streams. "Keiryu" is the Japanese word for mountain stream. Seiryu rods are designed for catching smaller fish in more placid waters - after they have come down out of the mountains and the water is too warm for trout. However, there is significant overlap in the two rods' characteristics! The softest keiryu rods, what Daiwa calls Zero rods and Suntech calls ZPRO rods, are designed to add as little as possible (approaching zero) to the natural bait, in order to achieve the most natural drift. That means small, light wire hooks, the least amount of weight required to get the bait down to the fish, the lightest possible line, and a rod that is soft enough to protect the ultralight tippets (some of which are around 1 lb test). Most seiryu rods are also quite soft rods, and can be fished with lines almost as light (9X tippet), yet most are designed for tippets up to about 6.5X, with the Daiwa Seiryu X rods rated for tippets up to 5X. caught with a Daiwa Seiryu X 54. So why would he want to start his guide business with seiryu rods? Well, I suspect the biggest reason is that the rods he intends to use, the Daiwa Seiryu X rods, are substantially less expensive. The Suntech FMX Keiryu ZPRO 63 shown in the top photo is $265. The Daiwa Seiryu X 64 would be $155. Is it as nice? Well, no, not really. However, it still will be very effective and it still will be a lot of fun for his clients. Fished with a keiryu line and markers for strike detection, the Seiryu X will work just fine. For that matter, younger anglers or rank beginners would probably have an easier time watching a half inch Nakazima float, and that would work just fine also. The fish that his clients will catch will not be huge, yet even modest fish will put a bigger bend in the Seiryu X rod than they'll have ever seen before. Isn't that where a lot of the fun really lies? Although inappropriate for the guide business because of the ultra thin (and thus a bit delicate) rod tip and higher price, the Suntech Kurenai rods are just as nice in their longer lengths (5.4 and 6.3 meters) as they are in the very popular 3.0 and 3.3 meter lengths. They are the lightest rods for their length that I know of. The action of the Kurenai rods is unlike the Daiwa Zero rods and the Suntech FMX Keiryu ZPRO, but it is reminiscent of the Suntech Aoi ZPRO. The longer Kurenai and the Aoi ZPRO are rods with soft tip sections and firmer midsections. Because of their soft tip sections, they will be extremely sensitive at strike detection. A fish taking the bait will cause the markers to dip or hesitate. The rods' soft tip sections will bend so easily that the fish will feel no resistance and thus they will not spit out the bait (and believe it, fish will spit out bait if they feel resistance on the line). The firmer midsections will allow you to set the hook effectively. Not much of a hook set will be required because the line will be tight. 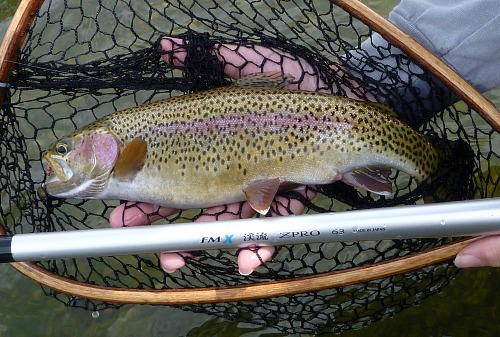 Taking out slack and overcoming water tension is the main reason a robust hook set is required when fly fishing. With keiryu fishing the line is close to vertical, with no line at all laying on the water's surface, and virtually no slack whatsoever. Looking back, I realized that I have rarely fished the ZPRO rods with bait, and I don't think I have ever fished the Daiwa Seiryu X or Suntech Kurenai HM rods with bait. 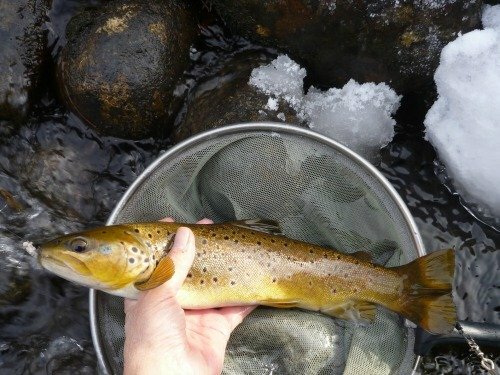 (Many of the streams I fish are limited to artificials only and I always seem to have new rods that need to be fished.) However, I am absolutely certain that they would do very nicely. They will be really sensitive and really fun. I think the guy wanting to start a guide business will be successful - he is in an excellent location for it and his clients will surely catch fish. Using the Daiwa Seiryu X rods will be a good business decision for him, but it could be a good fishing decision for anyone wanting an effective and inexpensive rod for keiryu fishing. The Kurenai rods are not as inexpensive, but they are much nicer and much lighter. And truly, the more I think of keiryu fishing with the Kurenai rods, with their insanely sensitive tip sections and firmer midsections, the more I think they would be just ideal for keiryu fishing for modest fish (up to maybe 14" in gentle flows, 10" or so with fast current). Since I first heard the idea of using a 6.4m seiryu rod for keiryu fishing I haven't been able to get it out of my mind. Today was the first reasonably warm day since he first mentioned it to me, so I set out to try it with a Suntech Kurenai HM63R and a Daiwa Seiryu X 54 (he bought the last Seiryu X 64 I had in stock and the replacements have not yet arrived). Winter fishing has never been very productive for me. A one-fish day is a good day and a two-fish day is reason to celebrate. I don't recall ever having a "many" day it the winter. Today I had high hopes but low expectations. It turned out to be a one-fish day, but that one fish was enough! The net hoop is right at 12", putting the brown at about 14 3/4". That's a pretty good fish for a Kurenai, but the most encouraging things were that it was hooked and fought in reasonably fast current and landed with 8X tippet. Once again, Coach has been proven right when he said I always underestimate the capability of the rods. The fish did get below me, but the rod is so long that when I held it straight up (perhaps not what you would want to do with a really large fish) it was not hard to get the trout's head to the surface and essentially slide it (surf it?) all the way back up to where I was standing. It still had some fight, but we were fighting where getting it into the net was at least possible. I guess I think of the Kurenai as modest fish rods because the tip sections are so soft. However, with a fish like today's (or even a bit smaller) the tip sections really do not come into play. They are soft enough that they are pointing directly at the fish. The battle is fought in the middle of the rod, and the longer Kurenai rods are firmer through the midsection than I had remembered. They're still not big fish rods, but fish in the mid teens are fair game even with some current. Also, landing a 14 3/4 inch fish, in reasonably fast current, with 8X tippet certainly suggests that the 6.5X, for which the rod is rated, should handle noticeably larger fish. Being a one-fish day, I didn't get to put the Daiwa Seiryu X to the test. However, one thing was clear as soon as I started fishing with the Daiwa Seiryu X 54: he made the right choice in the 6.4m rods rather than 5.4m. He will not be on a tiny stream, and the added length is a big plus.